New research on whirling disease, the malady killing trout populations in the West, has scientists crossing their fingers (HCN, 9/18/95: The West's fisheries spin out of control). The disease targets fish less than nine weeks old, destroying cartilage and causing the young fish to swim in circles. In search of a remedy, Richard Vincent, a fisheries biologist for the Montana Department of Fish, Wildlife and Parks, coaxed three strains of hatchery rainbow trout to hatch in cool water, where whirling disease spores cannot survive. By the time the water warms enough to support whirling disease spores, he says, the fish should be old enough to avoid contracting the disease. Vincent theorizes that fish which hatch at cooler temperatures will also spawn at cooler temperatures. 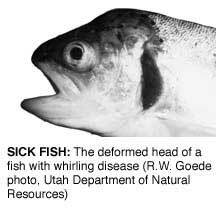 "If fish that spawn at colder temperatures can pass that trait on - which is unproven at this point - they will have a tremendous advantage," says Marshall Bloom, chairman of the Montana Whirling Disease Task Force. Bruce Farling of Montana Trout Unlimited says Vincent's water-temperature concept is promising but that more research is needed. "I really worry about people thinking we've got the silver bullet because we don't," he says, explaining that hatcheries often add to the problem by accidentally releasing infected fish. Farling believes nature will eventually outsmart whirling disease through evolution, as fish that can resist the ailment survive while others die off. Evolution already favors native trout species over the non-native rainbow. Native cutthroat naturally spawn in stream tributaries that are too cold for whirling disease spores. Bloom says in a laboratory setting, native trout are just as susceptible as rainbow trout, but a different lifestyle helps natives dodge the disease. For information, call the Whirling Disease Foundation (406/585-0860) or e-mail [email protected], or visit the foundation Web site at www.whirling-disease.org.